Northwestern students got to Ryan Field early Saturday. They stood toward the southeast section of the stadium, where they weren't far from Nebraska quarterback Tommy Armstrong as he warmed up. They yelled and heckled Armstrong. They poked fun at the interceptions he has thrown in the past, as well as the Huskers' loss to Northwestern in 2015. Armstrong didn't look over once. "Sometimes it’s funny but I try not to show emotion," Armstrong said. "I let my play to determine how they think. All you can do is go out there and shut them up." Not all the players operate quite like Armstrong, though. Safety Nathan Gerry is a little more direct with his thoughts. While he warmed up near the Northwestern student section, he was heckled about his muscles. One student yelled to Gerry that he must be on steroids, which prompted a response. Northwestern students heckling #Huskers players. 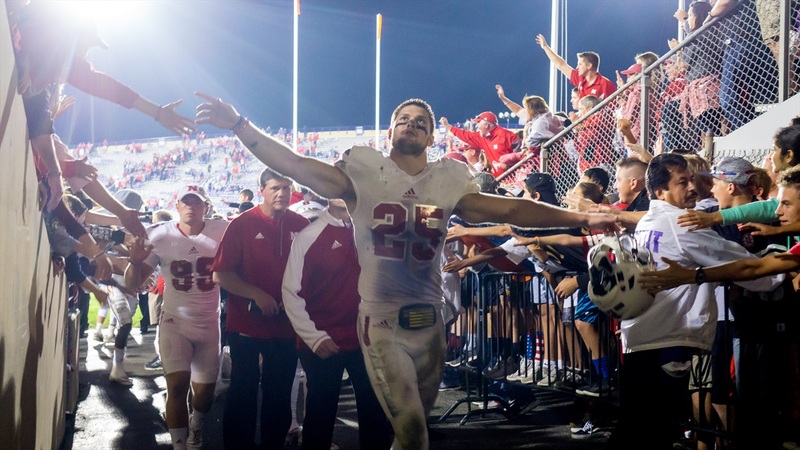 Asked @NathanGerry if he's on steroids. "I think it’s just fun," Gerry said. "Sometimes it’s nice to get away from home, sometimes to play in somebody else’s stadium and shut them up. It’s a part of college football. It’s pretty fun but it gets going a little bit starting early." Gerry's responce didn't surprise linebacker Josh Banderas. "That is Nathan Gerry," Banderas said. "That's the guy that I've known forever and have roomed with. That's his personality on and off the field. He never stops, he's got a constant motor and he likes his muscles." As for Banderas, he's more in line with Armstrong on how to deal with heckling. He won't necessarily respond, but he hears it and often laughs. "It's kind of fun," Banderas said. "It's a part of college football. It's a part of the atmosphere. Fans yelling at you, if you want to do something back, do it really quick, but it's fun. It's all in good fun." Armstrong, Gerry and Banderas are all seniors. They have experience with heckling and how to let it go. Younger members of the team are learning to do the same. "It was kind of funny at one point [they were] attacking a certain freshman," Armstrong said. "We just have to let that go in one ear and out the other. Let it fly away and focus on our game. I think that’s what we did." Armstrong's experience with heckling is beneficial for those younger players too. He knows how to brush it all off and believes the rest of the team is learning to do the same. "I think they understand," Armstrong said. "It's an away game. It's going to be tough and you're going to have fans saying certain things but at the end of the day, that's what we play for. That's what we expect going to an away game. You just have to make sure you stay together. You've got your team and your coaches out there. That's the only people that can actually hear all those things and let those things go. "Obviously your fans are out there but at the same time, when you're getting heckled by fans and all that, you've got to lean on your teammates and say, 'Hey, It's not that big of a deal. They can say things but we've got to focus on what we need to focus on.' I think we did a great job of executing on our first away game." Long story short? Heckle the Huskers all you want. They see it all in good fun. Hot Reads: The Big Ten West Favorite Is . . . Minnesota?